Those little bees work HARD for the honey! Did you know that a colony of bees will travel 55,000 miles and visit 2 million flowers to make 1 pound of honey? (1) They work hard, and the hard work pays off because honey is full of benefits. You want to get the raw honey over the processed honey to tap into all those benefits. The bees worked hard for it! Processed honey is heated up and oftentimes seriously filtered. Sometimes it even has added ingredients like high fructose corn syrup. Raw honey, on the other hand, is not heated up or filtered to the same degree. Plus, it has no added ingredients. Raw honey wouldn’t be heated higher than what it would get in a hive. This leaves all the beneficial nutrients, pollen, and enzymes intact. They filter regular honey a lot in the U.S., so your honey doesn’t crystalize. People get their underwear in a bundle if their honey has a few crystals in it. If your honey has crystals don’t worry. That’s good. Crystals are good because that means the good stuff is there. They also don’t add anything to it like high fructose corn syrup. You want the good stuff with no bad stuff. What does the good stuff do for you? Check out my top 5 favorite benefits. Raw honey is loaded with pollen. If you take about a tablespoon a day of raw AND LOCAL honey, you are helping protect yourself from allergies. You want the pollen to be from flowers in your area, so you are ingesting local pollen. This small exposure to the pollen will get your body to kick in with production of antibodies. 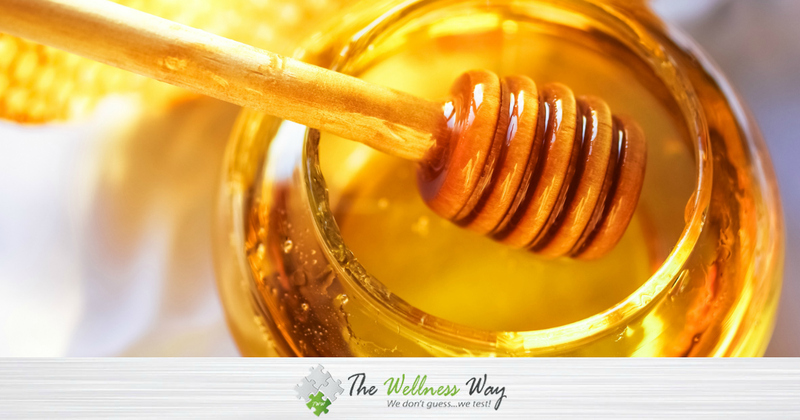 Plus, like noted above, honey reduces inflammation! Honey is great for your skin! That’s why we use it in our detoxifying coffee mask. It’s microbial and loaded with nutrients so it helps with acne and building skin. It also has enzymes that will help with a gentle exfoliation that’s even safe for sensitive skin. Honey is also very moisturizing, so you will have a happy, honey glow. As you can see, it’s well worth it to opt for raw honey and even better if you get it local. These are just a few of the many benefits. Another benefit is raw honey doesn’t go bad. If you see crystals in your honey just put the closed jar in a bowl of warm water to melt them away. Don’t let it get above 90 degrees! Why let filtering and high heat ruin all the potential those bees worked so hard for? Go for raw honey! Due to pesticides and herbicides the bee population is drastically going down. Don’t spray your dandelions and check out this article on the benefits of this first spring food for bees! Check out the video of Dr. Patrick Flynn visiting a Bee Farm. Would love to read articles on health!